. . . Rolando Villazón is magnificent, by turns ardent and angry and there's a stream of bright golden tone in a ringing 'O soave fanciulla' . . . Bertrand de Billy and the Bavarian Radio Symphony Orchestra make Puccini's score as fresh as a new coat of paint . . .
. . . Puccini's glorious masterpiece is brought to such vigorous and passionate life by a cast young enough to give a sense of reality to this tale of young bohemians taking a chance on love and life in Paris. Such is the vitality of the performances from Netrebko, Villazón, Nicole Cabell and Boaz Daniel that this passion would have been almost impossible to create in the sterile environs of the studio, yet the quality of the recordings makes it hard to believe this was indeed recorded as performed on the stage . . . Simply magical . . . Rolando Villazón and Russian soprano Anna Netrebko are opera's golden couple, combining immense talent with relative youth and beauty . . . Netrebko is a wonderful Mimi; innocent yet warmly sensual. Her voice is bright in its higher registers, yet the ringing tonalities never become harsh. Villazón is full of passion as the young poet Rodolfo . . .
. . . there is no question that both these singers are striking and deserve a considerable proportion of the attention that they have been receiving . . . [Netrebko] sings the part with insight and often with lovely tone . . . In Act 2 we encounter Nicole Cabell and I'm happy to report that she is a success . . . here she is secure, delightful, and an integral part of a lively team of performers . . . The more serious things become, the better Villazón performs. I suspect that it is his destiny, at any rate on stage, to suffer . . . It is good to hear the Bavarian Radio Symphony Orchestra in this music, sounding as if it loves it and is just discovering how adorable it is . . .
. . . the central duo and the fine conductor are excellent reasons for sampling this performance . . . Netrebko sings with expansive, gleaming tone . . . The jewel of the set is Villazón's impassioned Rodolfo, a portrayal of overwhelming generosity of spirit . . . It is succulently dramatic -- a tribute both to the stars¿ power and the conductor Bertrand de Billy¿s dramatic ability to steer the score at the drop of a note from uproarious jollity to the shiver that spells death. Villazón, of course, comes up to the mike first, bustling through the opening garret scene with an electricity that immediately separates him from Boaz Daniel¿s Marcello and the other bohemian chums. Villazón¿s Rodolfo radiates Latin heat throughout: every mood, from ripping bravado through tender concern to abject loss, is vigorously yet tastefully conveyed. Frailty may not be Netrebko¿s middle name, but she dampens her force sufficiently to be fairly convincing as the heroine doomed to have happiness snatched away by poverty, a cough, and the Paris cold . . . the two voices play in tandem very nicely. And the ending packs the emotional punch essential for any successful "La Bohème". Mimì fades, Rodolfo sobs: the tragedy is complete. No one surrounding them sounds bland. There¿s a raucous splendour about the Act II choruses; under de Billy¿s baton this Latin Quarter is particularly unbuttoned. Nicole Cabell¿s Musetta is also noteworthy: there¿s not just winking in her waltz, there¿s vulnerability too . . . Throughout, the Bavarian Radio Symphony Orchestra displays genuine snap and crackle . . .
. . . Deutsche Grammophon's new set really does have a lot going for it. For one thing, the recording itself has the atmosphere of a live performance . . . the clarity of sound is admirable . . . DG's engineers have worked wonders on the sound quality, which is pretty much that of a studio recording. Bertrand De Billy's conducting of the Symphonieorchester des Bayerischen Rundfunk is wonderfully lively, and again the recording acoustic allows one to hear all the details of Puccini's magnificent orchestration without any difficulty . . . [Netrebko]: I find the amount of detail she brings to the vocal line deeply appealing . . . she liberates Mimi from her potential status as a simpleton and injects her with a fieriness of spirit. The duet with Marcello, 'Speravo di trovari qui', for instance, is arresting in its depiction of Mimi's torn inclinations, and Netrebko's way even with 'Mi chiamano Mimi' is highly individual. Yet there's no doubt that Rolando Villazón's impassioned Rodolfo is the prime reason for buying the set. The part lies well for him, and, perhaps more than the other singers, he performs the work as if it's an opera in the theatre. The journey from playful young poet in the opening scene (which he easily dominates) to heartbroken lover in the mournful closing moments of Act IV has surely never been more vividly depicted, and there is absolutely no egomaniacal posturing during the more famous numbers. Villazón uses every colour available in his voice as a channel for his emotional commitment, which is never in question. I rather like the glamour of Nicole Cabell's Musetta: sometimes the character can be two-dimensional, but Cabell's treatment of the text and beauty of tone ensure that she doesn't get painted too broadly here. 'Quando men vo' is an excellent vehicle for her talents and she is by no means fazed by singing alongside her well-known colleagues . . . Stephane Degout's Schaunard, Vitalij Kowaljow's Colline and Tiziano Bracci in the multiple roles of Benoit, Alcindoro and Un doganiere, make a more than acceptable supporting cast. Praise is due to the rousing singing of the Chor des Bayerischen Rundfunks during the second act, which is a highlight (though occasionally some of the soloists' lines are lost on the recording). De Billy's conducting really does the score service, lingering only when the lyricism of the moment absolutely demands it and otherwise connecting instinctively with the quicksilver temperament of this most compact of operas. The recording is very smartly packaged, with shots from the new film of the opera that Villazón and Netrebko have made, of which this will become the soundtrack. Currently available at mid-price, this new account of the score is well worth exploring. Vividly recorded, vigorously conducted and sung by a distinguished cast still in their relatively youthful prime, it presents the score with an appeal that will be readily felt by newcomers and with a freshness that will make us of riper years feel . . . young again . . . The various elements . . . are all well defined and the great ensemble runs its joyful course so that we can almost feel ourselves to be part of it . . . it is important that Marcello has the presence and gaiety to be the file and soul and Boaz Daniel has all of that . . . [Villazón]: His voice is richly distinctive, his style genial and ardent. Netrebko is pure-toned and ample in climaxes . . . Netrebko sings with feeling and imagination and Villazón is an inspired, golden-voiced Rodolfo. In fact, these are as finely performed as in any recording known to me. The orchestra play almost as though reading a supplementary libretto, so vivid is their commentary. This is a recording which takes its place alongside the acknowledged "classics". He [Villazón] sounds relaxed and lyrical as the young poet. His high notes in the climaxes are vibrant and attacked cleanly . . . Netrebko, too, is in excellent voice, her gleaming soprano filling out Mimi's wistful phrases with grace and sensitivity . . . Heading the supporting cast that surrounds the bohemian lovers is the young American soprano Nicole Cabell, an emerging star in her own right. She makes a strong impression as the flirtatious Musetta . . . Boaz Daniel, an Israeli-born baritone, proves a sturdy Marcello. Bertrand de Billy conducts the Bavarian Radio Symphony Orchestra in a brisk performance of the tuneful score.
. . . frisson between the lovers is supplied by Rolando Villazón's impassioned, impulsive, gloriously sung Rodolfo. Fellow Bohemians Marcello and Schaunard are lively and quick-witted . . . Nicole Cabell sings with gusto in Musetta's irresistible waltz song. Without short-changing the moments of extreme tenderness and pathos, De Billy conducts with youthful ardour and an acute feeling for the score's variegated colours. The recording . . . is a wonderful showcase for their rapport, as well as a beautiful embodiment of Puccini's score. The composer could scarcely have asked for a better birthday present. The music-making, aided by a striking sound mix, conveys the hothouse feel of "La Bohème" with ideal stylishness and emotional impact, as theatrical as any stage production. As for Netrebko and Villazón, one need only sample the duet "O Soave Fanciulla" to feel their idiomatic nuance and depth of feeling. They soar on their own, too. Villazón's Latin timbre and expressive generosity are arresting in "Che Gelida Manina," with the excellent Bavarian Radio Symphony under Bertrand de Billy supporting the Mexican tenor with heart-swelling richness. The orchestra does the same at the peak of "Mi Chiamano Mimi," leaving the listener emotionally defenseless as Netrebko rides the wave . . . Netrebko's performance isn't just loveliness, either; her phrasing is totally genuine as dramatic utterance. The rest of the cast is strong, especially American Nicole Cabell as Musetta. As theater for the ear, this set is transporting; it also clears the shelf of decades' worth of lesser recordings. As a pure audio experience, this Bohème has plenty to offer, particularly in the conducting and playing of Bertrand de Billy and his Munich forces, and in the dramatically alert Rodolfo of Villazón. The tenor projects such a sense of involvement and immediacy that his work is on a plane well above the rest of the talented cast. Every phrase of Rodolfo's music is brimming with honest life: musical niceties never feel artsy or artificial . . . Villazón sounds to be in reasonably good shape and turns in a high-voltage performance . . . Villazón brings a wrenching intensity to Rodolfo's monologue about Mimì's illness, and even his declamation of the final spoken lines of the opera manages to be individual without seeming gimmicky. Netrebko's Mimì offers her customary abundance of rich, plush tone, and her high notes soar magnificently. Her instrument is perfectly suited to Puccini . . . this is a singer who brings an enormous amount of energy and commitment to her performances . . . Nicole Cabell is having a great deal of stage time as Musetta these days, and it is no wonder; her "Quando me'n vo" is sumptuous and suggestive, and she clearly has fun with the role . . . Israeli baritone Boaz Daniel is a sympathetic, handsome-sounding Marcello, very responsive in his Act III scenes with Mimì and Rodolfo . . . Stéphane Degout, a terrific storyteller, makes the most he can of Schaunard's Act I monologue . . . When Degout does get to do some real singing . . . he sounds very impressive. Ukrainian bass Vitalij Kowaljow delivers an ardent, sufficiently sad "Vecchia zimarra" . . . De Billy serves up ensemble playing and singing that are truly crisp and exhilarating, rather than merely accurate: his balance of robust, youthful energy, dramatic drive and emotional delicacy is superb. The orchestra of the Bayerischen Rundfunks is dazzlingly responsive, constantly mining Puccini's colors and textures to their full effect. Netrebko sounded a little more vulnerable, a little breathier. We're reminded that Mimi is very ill in this story, and you can hear that . . . Anna Netrebko and Rolando Villazón are doing more acting with their voices, and they are taking more chances . . .
Mr. de Billy conducts a buoyant and colorful performance . . . [Villazón] sounds in good vocal condition, singing with richness and urgency. As usual with Ms. Netrebko in live performances, her involvement and spontaneity result in moments of blemished singing. Still, her voice is luscious, and she gives a poignant performance. [Tuttle]: . . . a credibly young cast, sensitivity to the libretto, detail-oriented conducting that nevertheless does not lose the forest for the trees, fine ensemble spirit, and spectacular sound. What DG has, however, is Anna Netrebko and Rolando Villazón . . . Netrebko and Villazón do bring character to their roles in a way seldom approached . . . I liked most of Bertrand de Billy's tempos . . . he allows Puccini's music more ebb and flow, and is more Italianate . . . Both the chorus and the orchestra are excellent . . .
. . . the exuberant, world-class performers blast you away . . . the screen fizzes with charismatic interplay and fun . . . exquisite music.
. . . strongly sung and robustly acted throughout . . . Dornhelm offers viewers the opportunity to hear big singing at a reasonable price.
. . . chocolatey richness directly into the vein . . .
. . . soaring music and big emotions . . . a fluid piece of cinema that makes inventive use of its handful of sets, and uses its Christmas Eve setting to create a warm seasonal glow. Opera dream team Anna Netrebko and Rolando Villazón bring star- and lung-power to this faithful adaptation of Puccini¿s much-loved tale of passion and poverty in 19th century Paris . . . this big-screen adaptation is a fine place to start expanding your cultural horizons . . . director Dornhelm complementing the virtuosity of his performers with pleasing camerawork and subtle stylistic flourishes (colour fades, split screens, and an impressively stark finale).
. . . the thumbs up to a new feature film version of "La bohème" which captures the most intimate moments of the doomed love affair at the heart of the story while sacrificing none of the theatricality and musical values of Puccini's opera . . . Dornhelm succeeds in bringing all of La bohème's most intimate moments to life. Most effective of all is, undoubtedly, the final scene of the opera. As Mimì, played by the sublime Anna Netrebko, lies resting in a convincingly bohemian chair in Rodolfo's attic, her voice is heard singing her final aria 'Sono andati?' while the screen merges into a melancholic black and white slow motion sequence. Here, Mimì and Rodolfo's last kisses and embraces are captured tenderly by the camera, lingering on the pair for what longs to be an eternity. It's a fantastic moment that's especially compelling on film. Another scene that has been brilliantly mastered for emotive effect takes place at the opening of Act III. Here, Mimì, her illness ever worsening, approaches the toll-gate in search of Rodolfo. Her despair and anguish are felt through Puccini's music, but also enhanced and reaffirmed through some wonderfully cinematic images . . . "La bohème" is also full to the brim with some of the best vocal talents of today. Singing the leads are two operatic celebrities who are known for 'a certain movie-star quality' and who, in this production, definitely live up to expectations. Both Anna Netrebko as the young (but not so innocent) Mimì and Rolando Villazón as Rodolfo appear relaxed and natural in front of the camera, adapting well to the big screen. Their voices are beautifully caught on playback . . . As always, Netrebko exercises her charm, drawing you into every movement and sound she makes, with her velvety voice that is dramatically versatile and expressive . . . a breathtakingly dramatic and emotional La bohème that compares well to the best of its antecedents on stage. Rolando Villazón was in fine voice: a heroic Rodolfo, golden toned as he charms Mimi in his Act I aria and properly melancholic for the farewell duet. Vividly recorded, vigorously conducted and sung by a distinguished cast still in their relatively youthful prime, it presents the score with an appeal that will be readily felt by newcomers and with a freshness that will make those of riper years feel . . . well, feel young again . . . The various elements -- the main solo group, the Christmas Eve crowd, the children (in splendidly disciplined high spirits), the stage band -- are all well defined and the great ensemble runs its joyful course so that we can almost feel ourselves to be part of it. Among the singers, it is important that Marcello has the presence and gaiety to be the life and soul, and Boaz Daniel has all of that. Stéphane Degout as Schaunard [is lively and stylish] . . . The lovers Anna Netrebko and Rolando Villazón are a famous pair and deservedly so. His voice is richly distinctive, his style genial and ardent. Netrebko is pure-toned and ample in climaxes . . . Netrebko sings with feeling and imagination, and Villazón is an inspired, golden-voiced Rodolfo. In fact, these are as finely performed as in any recording. The orchestra play almost as though reading a supplementary libretto, so vivid is their commentary. This is a recording which takes its place alongside the acknowledged "classics".
. . . der Hit des Monats.
. . . das wohl beste "Bohème"-Paar der Gegenwart . . . Villazón schmachtet differenziert und geizt nicht mit seinem herrlichen Tenor, und Netrebko gibt eine mit leuchtendem Sopran vergehende Mimi, dass es eine herzzerreißende Freude ist . . . [Bertrand de Billy] hat das Ruder sicher in der Hand und sorgt mitunter für geradezu kammermusikalischen Klang. Die Live-Aufnahme aus dem Münchner Gasteig 2007 ist ausgezeichnet gelungen. Da gibt es keine Einbrüche . . . Rolando und Anna sind ein Traumpaar . . . auf höchstem Niveau . . . Bertrand de Billy dirigiert . . . ohne Sentimentalitäten, sodass die Idee des "Verismo" sehr gut herüberkommt. Nicht nur optisch, sondern auch stimmlich passen die beiden hervorragend zueinander. Die Klangfarben ihrer Stimmen sind eher dunkel, und das Fundament, auf dem sie die Höhe aufbauen, wirkt substanzvoll und satt. So ist . . . Villazóns Rodolfo vermag temperamentvoll zu werben -- und findet in der Netrebko eine Mimì, die sich mit reißen lässt. Ihr Sopran blüht auf, zeichnet mit üppigem Legato klare, weite Bögen und erzeugt in der Mezza voce Töne von schwebendem Charakter. Ihren Sinn für die großformatige Gestaltung der Rolle erweist die Netrebko im dritten und vierten Akt -- man spürt die gefühlsmäßige Entäußerung, wenn sie etwa im Duett mit Marcello vokal vorwärts prescht und dem Ton zugleich mehr Luft beigibt. Und Villazón ist ihr -- noch einmal -- ein leidenschaftlicher Partner . . . Ein Glanzlicht setzt der Aufnahme Nicole Cabell auf. Ihre Musetta braucht nicht absichtsvoll zu girren -- das warme Fluten ihres Soprans tut schon alles . . . eine individuelle, überzeugende Lesart . . . Das musikalische Geschehen gewinnt Profil aus dem Kontrast zwischen einer jugendlich wirkenden Lässigkeit und der scharfen Profilierung der instrumentalen Figuren, was von der Tontechnik hervorragend eingefangen wurde. Chor und Symphonieorchester des Bayerischen Rundfunks bieten erstklassige Qualität. die Sopranistin Anna Netrebko und der Tenor Rolando Villázon [verkörpern] augenblicklich wie niemand sonst die Lichtgestalten der Klassik . . . Puccinis vierte und beliebteste Oper . . . wirkt frisch, gültig und glaubhaft, ewig sogar . . . Diese "Bohème" hat sehr viel Gefühl . . .
. . . [Villazón] singt, wie zuletzt schon auf der Arienaufnahme "Cielo e Mar", als ginge es um sein Leben . . . [er] fasziniert nach wie vor in seiner sehr weichen Stimmführung und der Attacke . . . Herrlich gut gelaunt und mitdenkend präsentiert das Symphonieorchester des Bayerischen Rundfunks (inklusive Chor) einen Butterklang nach vollfetter bayerischer Art, im Bedarfsfall auch sanft aufgetragen und schön verziert vom Dirigenten Bertrand de Billy. Der Mexikaner kann die Töne dehnen, die Rubati auskosten, wie er möchte. Und er tut es geschickt und mit Geschmack, sein Rodolfo klingt stimmig und schön . . . auch bei ihr [bleiben] keine Wünsche offen, sie füllt die Rolle der Mimi in jeder Hinsicht aus, lebendig, lebenslustig, kokett und mit anrührender, nicht ausgewalzter Tragik am Ende. Und Bertrand de Billy führt das Orchester des Bayerischen Rundfunks zu knackig-akzentuiertem Spiel, zügelt die Sentimentalitäten, ohne Puccinis Lyrismen zu gefährden, und schärft die bedrohlichen Untertöne: Eine "Bohème" mit viel "Tosca" drin. Sie singt souverän . . . mit vielen musikalischen Nuancen. Ihr Gesang ist bewundernswert . . . [Villazón] trägt sein Herz auf der Zunge, ist pure Leidenschaft und Lebenslust, totale Hingabe . . . Die attraktive Nicole Cabell als Musette, Boaz Daniel (Marcello), Stéphane Degout (Shaunard), Vitalij Kowaljow (Colline) -- alles gute Sänger . . . Das zweite Bild mit seinen Genre-Szenen klingt orchestral wie auch klangtechnisch sehr vital . . .
Schon der Beginn der Oper klingt verheißungsvoll: Das Symphonieorchester des Bayerischen Rundfunks präsentiert sich unter der Leitung von Bertrand de Billy vom ersten Takt an als jener exquisite Klangkörper von geschmeidiger, in allen Belangen differenzierender Tongebung und rhythmischer Elastizität, als der er diese Aufnahme bis zum Schluss maßgeblich prägt. Der gute Eindruck wird von der ersten Szene bestätigt: Boaz Daniel . . . führt sich als Marcello mit virilem Timbre, sprechender Artikulation und hörbarer Lust an der Differenzierung zwischen Parlando und Kantilene ein. Rolando Villazón tut es ihm gleich . . . Eine Meisterleistung ist auch die akustische Inszenierung des zweiten und des dritten Bildes. Tonmeister und Dirigent verhelfen dem großen Ensemble . . . weitgehend zu einer geradezu idealen klanglichen Transparenz und Räumlichkeit . . . Puccinis Oper erzählt die anrührende Geschichte zweier junger Menschen und bietet damit Rollen, die für Sängerdarsteller wie Netrebko und Villazón wie geschaffen scheinen. Beide verbinden Attraktivität sowohl der stimmlichen Mittel wie der äußeren Erscheinung mit einem leidenschaftlichen Agieren von einer auf der Opernbühne noch vor wenigen Jahren kaum für möglich gehaltenen Körperlichkeit . . . Ihre stärksten Auftritte hat die Netrebko, wenn die Musik zur emotionalen Expansion einlädt: "O buon Marcello, aiuto" im dritten Bild ist gut getroffen . . . [Villazón] kommt diese Partie sehr entgegen. Die komödiantischen Szenen mit den Freunden entsprechen seiner vitalen Spielfreude aufs Beste, auch das Umbrechen in den tragischen Ton . . . ist wie für ihn geschaffen. De Rodolfo et Mimi, c'est la soprano qui capte immédiatement l'attention, moins par ses mots, souvent flous, que par la moire de son timbre. La couleur voluptueuse, l'expansion d'un aigu profus . . . [sont] d'un vrai lirico assurément . . . [Villazón]: Timbre capiteux, phrasé de miel, fougue adolescente ont tout pour séduire.
. . . cette "Bohème" est de bout en bout efficace et crédible dramatiquement. Le mérite en revient d'abord à la direction limpide de Bertrand de Billy, qui fait claquer avec fierté l'orchestre puccinien, tout en suivant à la loupe ses chanteurs . . . la générosité, l'engagement de cet artiste rare sont là, de même que le timbre, toujours aussi frais et irrésistiblement beau . . . En Mimi, Anna Netrebko livre de superbes phrases dans ses airs du I et du III . . . Rayonnante et chaleureuse . 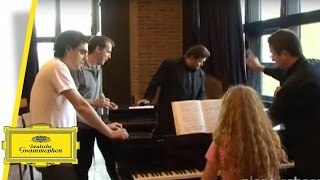 . . voici une "Bohème" qui se tient et s'écoute avec plaisir . . .
. . . el tenor mexicano, que con su canto extrovertido y generoso y su estilo apasionado encuentra en Rodolfo . . . un vehículo congenial a sus medios . . . una magnífica toma de sonido y una gran teatralidad, sin duda también por la dirección de Bertrand de Billy, que alterna momentos de expansión lírica (final del primer acto) con una visión concatenada de las escenas.